Dream Big is a great house/duplex for a gathering or retreat. Right across from the beach, it has a private pool and an elevator. Sorry! No college groups without a faculty advisor or coach. Dream Big sleeps 24-36 guests (maximum of 30 adults). Please note there for the Hangout Music Festival there is a $1000 Refundable Damage/Cleaning Deposit to ensure the house is left as expected. Dream Big rents as a whole and has connecting doors on two floors. It has 12 bedrooms, 10 full baths and lots of room to spread out over 3 floors and 7000 sq feet. Each side has 2 refrigerators, 2 dishwashers, and 2 full laundry rooms. Large 18'x36' private pool and outdoor gathering space with grills and seating for outdoor dining. You'll find a nice combination of larger common spaces for togetherness, and lots of private bedrooms with porches. The first floor has a family room on each side with a large tv/dvd, etc so the kids have a place to call their own. Each side has 6 spacious bedrooms, each with TV. 10 of those bedrooms have private balconies overlooking either the Gulf, or the pool & Little Lagoon beyond. Each side has 3 king bedrooms (one also has a daybed), 2 bedrooms with a queen bed plus a daybed & trundle, and a bedroom with just a queen. The large pool area offers lots of lounge chairs, tables for outdoor dining, grills and an assortment of beach chairs, a beach wagon & pool toys you are welcome to use during your stay. 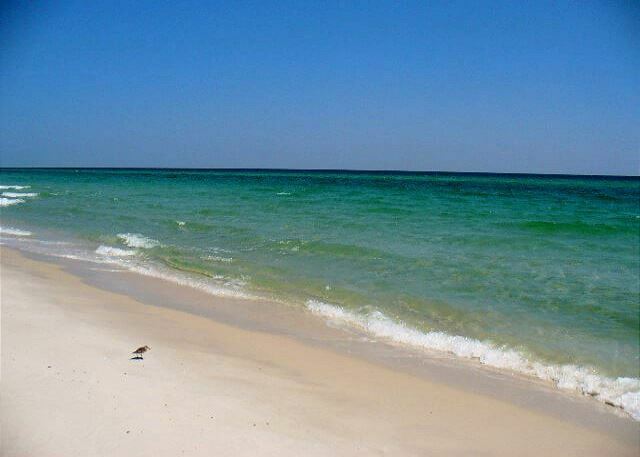 Located in family-friendly West Beach, 2.3 miles west of Hwy 59. Away from condos & crowds, still quite close to restaurants, shops & attractions. Here is the layout for each side : First floor has family room with TV/DVD, books and board games so the kids have a place of their own. Also on the first floor you'll also find two bedrooms, two baths and a laundry. The second floor has a large living and dining area plus a kitchen with a big island and two dishwashers. This kitchen was designed to comfortably accommodate lots of people! You will also find a bedroom and full bath on the second floor. The third floor has three bedrooms, a king with a private bath, and a queen bedroom, and a bedroom with a queen plus a twin daybed with a twin trundle. The queen and queen plus daybed bedrooms share an adjoining bath. All floors have decks on the Gulf and pool/Little Lagoon sides. Each of the spacious bedrooms also has its own television. First Floor: King Bedroom, Queen Bedroom with Daybed and Trundle (2 twins), Family Room has Queen Sleeper. On the east side the first floor king also has a daybed (no trundle). Third Floor: King Bedroom, Queen Bedroom with Daybed and Trundle, and Queen only bedroom. On the west side the third floor king bedroom also has a daybed (no trundle). We found the home just as described, plenty of room for everyone and a nice size pool. Gulf Shores Rentals was great about answering questions and the app for the home/trip was awesome. I would definitely recommend working with them if you are planning a vacation in the area. We rented Dream Big to surprise our parents with a family vacation. The crew at GSVR worked with us on so many things for this vacation, and they were so helpful and professional. The accommodations were wonderful! Plenty of room and space for 20+ of us; and we used every inch of it. The pool was a great bonus and was used daily! We loved our week there and I know our parents were truly surprised and had the time of their lives. Thank you GSVR! Dream Big was wonderful! We've previously stayed in condos when visiting Gulf Shores. This was a big improvement. We could all be together yet have our own space. It had the best dining area for our extended family. Nice rooms. Loved the private pool. Our main complaint is that we had to wash our own towels at the end. Would really have preferred not to fool with that when leaving. We do ask you to start the towels--it keeps them from being left wet on floors and beds and results in many, many fewer personal items being left behind. Our family of 30+ people had a wonderful vacation here. It is a perfect layout for multiple families. We had easy access to the beach. Having a private pool for us all to enjoy was one of our favorite things. The owners were very responsive when we had a concern about the air conditioner and had someone come look at it within a couple of hours on a weekend day. It was Great! We really enjoyed ourselves. This is the 2nd time that we have stayed at one of your properties. We will be back again. The location is perfect, the house a great arrangement for our 30 people. The 2 full kitchens are fantastic. The elevator and pool sealed the deal because elderly parents are able to get around so easily and can enjoy the water w/o navigating the sandy beach every day. Every issue we had was addressed quickly by the rental crew and we'd go back in a heartbeat. Highly recommended! The only thing we missed was a tutorial on the thermostat. Everyone had a great time. Age 75 to 3 under 6 months. Pool and beach were wonderful. 29 people, lots of mouths to feed. 4 dishwasher, 4 washing machine going all the time. Used for big tent and volleyball net rental for a week. Used Zek’s for fishing charter, limited out on Red Fish, had Fisher’s seafood restaurant cook it. Best we have ever eaten. Property was as described, lots of traffic on west beach road. Mid June traffic is a mess anywhere around Gulf shores. Saturday afternoon check in off of I20 around Mobile was bad coming from the West . Get to the beach early. It was so good to have all of the family together in the house. The pool was great and the closeness to the beach was convenient. The young ones enjoyed the family rooms which gave them their own area to watch TV and play games. We had a great time and everyone enjoyed the Gulf Shores area. Plans are already underway for the next reunion. Controlling the cooling of the house was a challenge at times. There were areas which were cooler than others. The east side had some warm spots. On the east side second floor (main level), the living area was warm and the bedroom area was cold. And on the 3rd level, the front bedroom was warm and it did not shade or curtain on the window which added to the warmness of the room. The dryers seemed to take a long time to dry the clothes and towels, but we adjusted the size of the loads and things improved, though it recommended that the venting be looked at. After one of the thunderstorms, power was lost by most of the homes and businesses in the area for 2-3 hours. This, of course, is what can happen in the summer on the Gulf coast. When the power went back on, a couple of the breakers needed to be reset, but it was easy enough to do with help from the office. All in all, we would recommend the area and would rent the house again. Our high school baseball team stayed at Dream Big in late March 2018. As advertised, the property easily accommodated 25 players and four coaches with plenty of room to spread out, but also large enough areas to meet. There were a few minor issues upon arrival, but they were handled promptly by the owner/manager. We would definitely stay here again. The constant communication leading up to our arrival and the help upon arrival was top-notch. We have taken similar trips for the past 6 years and this was by far the most detail oriented and customer driven renters we have ever interacted with. What a lovely place to have a large group!! Our group of 14 had plenty of room to spread out. The home was very clean and kitchen amenities were great! The front porch was a great gathering place in the evening and the pool which was well maintained, gave us hours of pleasure visiting and swimming. Having the beach across the street made it nice for our morning walks. The property management team was attentive to our needs. They tried very hard to correct the issue with the internet which was having a hard time with that many people and their electronic devices. All in all, this was a great place to vacation. We rented both sides of Dream Big for our college softball team of 21 players and 3 staff members. Dream Big slept all 24 of us very comfortably and while still feeling like each person had their own space. Dream Big was located just minutes away from all the restaurants and shops on the main strip. Just a walk across the street and you are at the beach! If we get the chance to return to Gulf Shores, we will definitely stay at Dream Big! We stayed at Dream Big for 4 nights in May with our large family to celebrate our elderly great grandparents 60th wedding anniversary. The house was large enough and configured well for a large group. We thought the space was great. Th house does have 4 levels of stairs! There is an elevator but it only serves one side of the house. The elevator works and used it repeatedly for our grandparents. Unfortunately, we had no AC for the first day, night, and second day. Gulf Shores Rentals tho was fantastic at assisting us and taking care of the problem. They sent 2 repair people out to ensure it was corrected and stayed in touch with updates regularly. Our stay would have been perfect if the AC would not have gone out, but we appreciated Geoff’s help in the matter and his diligence. This is really a great company! They also compensated us appropriately. The WiFi is spotty and kept going in and out so Geoff arranged to have a portable hot spot dropped off at the house. The house is across the street from the beach. It’s a very quick walk but there is no direct access. The pool is fantastic and very enjoyable. House is also stocked with beach carts and chairs etc. such a fabulous rental!!! Luckily we were able to replace the air conditioning unit on the second day so we should be good for another 10 years! Wifi was related to an area wide Mediacom issue and is one of the downsides of being in a small town--few providers, few repair people but it usually is pretty reliable and we hope you'll go enjoy the beach/pool/restaurants/activities when it is not:-). management a few miles down the road. We have stayed at each. Thanks Susan and Geoff! We'll be back. Dream Big was a wonderful rental property. The rental matched the description very well. Everything was clean and ready the moment we walked in. There was lots of room for everyone. While the beach is beautiful and the water warm and inviting, having the pool was a very big plus for when kids tired of the salt and sand. We would very much recommnend this property! Great vacation at "Dream Big"
Our family was very happy with "Dream Big" house. It was just right for our size family. The management and staff were very helpful and did not mind dealing with and OLD lady with a big family. Thanks for your courtesy. Overall the property was perfect for our reunion. Management was very accommodating. Plenty of parking, AC cold and the home had pretty much what we needed when we arrived. We will defiantly consider this home for future reunions. Our stay at Dream Big was like a dream come true!! Everything about the house was perfect for our sibling reunion. In fact, we are just now talking about booking it again it 2018. Dream big vacation rental was more than we imagined it to be...We had a party of 26 guest and it fit everyone nicely. We really enjoyed our stay from beginning to end. When we first arrive we got off on a rocky start, two of our guest got stuck in the elevator for about 20 minutes but the main office stay on the phone throughout the whole process. I would recommend the staff post visible signs next to the elevator on how to use the elevator properly because it's needed in this house with all those stairs. The pictures are true to how the house look. Overall we had an awesome time everyone truly enjoyed their stay and we will come again. Dream big is exactly what me and my family decided to do when planning my mothers 71 year birthday celebration. Oh boy, what a celebration, Dream Big is awesome, we will add it to next year's family trip. The house was just right for our large family. The WiFi was a big issue. It was not up for long periods of times and some had work to complete and could not get it done and submitted. Several calls were made but it still was not fixed.Could a stool be supplied to reach the microwave? Some could not reach it. Loved all the porches and the seating capacity was great.The pool was wonderful and the floaty devises were so much fun and maintainence appeared quite a lot to check on the it's cleanliness There was more than enough parking for our cars. Our vacation went way too quickly. We were all sorry to leave. Amazing time At Dream Big!! Our vacation at Dream Big was absolutely fantastic! The house was amazing, plenty of room to accommodate the 9 families we had. We had issues with one of the bathrooms and the internet and literally they were there the same day we contacted maintenance to fix the problems. The pool was great, the distance to the beach was perfect. We will definetely go back!! I give the property overall a very good review. I do believe that the utensils should be looked over. We did have to wash several things before we used them. There was only 1 can opener and it barely worked at all. It's probably a good idea to have the cleaning people put the dishes away so that they can checked. Please let us know if you need something during your stay! We were easily able to add can openers on the day the guest told us the house needed more, but we would have liked to bring them as soon as they knew it wasn't working well! We held a 3 day corporate meeting at Dream Big. We wanted an off site get away where we could do some team building and blow off some steam, while holding casual business meeting during the day. It was a great property for this purpose and accommodated our 11 person team well. The wifi worked as needed and there were ample pots/pans and cooking utensils (strangely no coffee filters). We would consider coming back again. My main criticism stems from the 2 or 3 daily emails that I received from the property management firm reminding us about check out procedures such as cleaning and doing laundry. A $699 cleaning fee was paid, so I'm curious why such exacting cleaning requirements were needed. I understand that in peak times they would need to turn these units around quickly and a $700 fee would allow the property management to hire an adequate staff to turn this place around quickly without having the renters do most of the heavy lifting. We were very pleased with every aspect of this rental home. Overall we had a decent stay at Dream Big. The building is showing some wear and tear. We were not at all happy about the cleanliness of the place. It did not look like it had been cleaned very well, especially in the bathrooms. One example is the one bathroom had old, dirty soap bars caked in the corners of the soap dish - obviously this hadn't been cleaned in quite some time. The furniture around the patio is very weathered. Please, please let us know if something is not right. We agree, there should not be residual soap in the soap dish and apologize that we did not notice when inspecting the house. It is definitely time for fresh paint for interior walls and exterior furniture! When you return, we think you'll be pleased. Our group of ladies from Lanett 1st Baptist had a wonderful time during our visit to Dream Big in Sept. The beach house was very spacious with the kitchens well equipped. Everyone said this was our very BEST trip to date and that the accommodations were excellent!! Would highly recommend to any group or family!! We had a fantastic time in Gulf Shores. The house Dream Big was perfect for a large group like ours. The house had plenty of bed rooms/ bathrooms. Both kitchens had plenty of cook ware for us too cook most of our meals. My mother has cancer and has to be moved around in a wheel chair. So having the elivator was priceless. Our whole group was very impressed with the house and the attention to detail. the private pool was the icing on the cake!! It was so nice coming back from the beach, rinse off at the out door shower and then just relax in the pool. Overall very pleased with the house Dream Big! I loved the Dream Big house! We had a great stay! The West first floor bath (the one closest to the pool) needs work, shower head and tub spout were in very poor condition, very little water pressure. Pool was very clean, outdoor shower was great! If you find an issue, please give us a call. During your stay you have both a cell phone number to reach us at any time, and a mobile app with a place to report a maintenance issue (it texts us) if you don't want to call. We would have been happy to take care of the shower head issue during your stay, but we didn't know about it. We appreciate you letting us know and were able to fix it in just a few minutes. Dream Big fit our spring break needs very well. We had 34 in the house and had plenty of room. The beds were comfortable, the house was well decorated and the kitchen was well supplied. The property managers were wonderful, helpful and easy to communicate with. We thank them for all their understanding when we had to leave early. We are not just the property owners, we are the owners! We appreciate you staying with us. I am very satisfied with my entire rental experience. Everything from finding a house to arriving went very smoothly. The owners of this house are wonderful people and they put a lot of work into making sure their customers are taken care of and happy. The house looks wonderful and the kitchen is nice. It has a great view of the beach and it only takes about 2 minutes to walk over. The "Dream Big" is a dream come true. The "Dream Big" was a great rental property. It was clean, big & Spacious enough for my entire family. The views are amazing overlooking the ocean. My family and I really enjoyed our stay. Absolutely gorgeous! We had 22 adults staying in the house and we could have easily had more! There was plenty of room to spread out if you wanted privacy and plenty of seating in the kitchen/family room area to all hangout together. The kitchen has everything you would need; even a crockpot that came in handy. The house was right across the street from the Gulf and was in a nice and quiet area. The views from the house were amazing. I would love to get a big group of people and go back again soon! We rented both sides of this home, and there were doors on floors 2 & 3 that connected the 2 sides of the duplex together. The photos do not do this beautiful home justice. It is very spacious, and the rooms elegant. The elevator was helpful for my elderly father, and also for moving luggage and supplies to the upper floors. I do feel that expecting us to wash and dry all the towels before departure was just unfair. It was also not clarified in the contract before we agreed to rent the property. The house was great. It surpassed our expectations. The private pool was great and we enjoyed all of the beach chairs and pool equipment supplied with the house. The house is also within a short drive of many great golf courses. We hope to be back at the Dream Big house in the future. Dream Big lives up to its name! Our family vacation at Dream Big accommodated all 29 of us with plenty of room to spare. There were very few issues with the house and all were addressed in a very timely and professional manner by the maintenance staff. The pool area was a huge draw for our family vacation along with just being right across the street from the beach. In addition to the above 6 of us went on deep sea fishing trip on a boat named "Distraction." This was truly the best fishing trip any of us had every been on we would recommend Captain Troy Frady and his first mate Stephen to everyone! Great family fishing trip for all ages! The Hangout provided a great venue for live music for the 21 and older crowd. We had a family reunion at Dream Big in Gulf Shores in July. Ages ranged from 6 mo the to 69 years. The house was awesome and accommodated our group nicely. People found many things to do and having our own pool was great. Everyone had fun and we would recommend Dream Big to anyone who needed a large facility. Myself and 15 of my close friends came down in mid-May for a guys only trip. We found the house to be very spacious. Most of people were able to have their own room and bathroom. There were a few that had to bunk up together but no complaints. The pool was great! The kitchens were great! We loved spending our evening on the large front deck as well as by the pool. The location of the house is great. From the upper levels of the home, there are great views of the lagoon as well as the gulf. We also like how the house was located about 2 miles from the heart of Gulf Shores so we had our privacy. The management team is very responsive. Our group arrived earlier than expected and they allowed us to hangout by the pool until the house was ready for us. We had an issue with the wast bins outside filling up pretty quickly, a phone call to Susan was all that was needed and our bins were picked up the next morning. I would definitely recommend this house to a friend or relative. There is not one negative thing I can say. In fact, there are several members of our group that hope to make this an annual trip with our wives. Thanks Geoff and Susan, hope to see you the same time next year! Dream Big is a beautiful place! We were there for 7 nights in August with 25 people, 19 adults, two teens and 4 kids ages 5 and under. There was plenty of space, the pool was great, the beach beautiful. The house exceeded our expectations, the kitchens are stocked very well, the 4 laundry rooms and elevator were such a bonus. The property owners were very responsive to the two maintenance issues we had. We gathered morning and night on the porch outside of the main living floor and thoroughly enjoyed ourselves. Would definitely recommend! We had family together from around the country. With 10 grandchildren, the private pool, more than adequate space for living, and even an elevator helped to make our stay the best ever. They even had wagons for pulling beach chairs and toys across the street to the beach! We would highly recommend Dream Big. The owners responded quickly with the few needs we had. Whatva perfect place to vacation. We brought 36 family members and they were are delighted with their rooms. We are foodies and we were all delighted that the kitchens each had 4 dishwashers in the 2 well outfitted kitchens. The furnishings were attractive and comfortable. The kidss loved the pool and picnic area. And the beautiful beach!!! Really nice in every aspect. Great experience. Fantastic facility. Property was clean, spacious, and convenient to beach and restaurants. Players, coaches, and parents were very impressed with the unit. Also, the property owners were very professional and cordial in all of our communications. We were greeted on our arrival and wished farewell on our departure. We would definitely recommend "Dream Big" and its owners to anyone looking for a quality unit. We WILL be a repeat customer !!! Seven parents chaperoned 17 high school seniors for Spring Break, and it was an outstanding venue. The house was beautiful, comfortable, and affordable. Having a private pool made it unique and an opportunity for a late night 'safe zone' for our young adults. It's a brief walk to the beach, and the area is well maintained. As chaperone's we felt comfortable with the environment and the location. As well, we would all be willing to take future seniors to this location/house if they wanted a 'beach retreat'. We had 35 Christian ladies to stay for our Women's Retreat Ministry. It was just fantastic and we loved the elevators since our ages range from 30 to 80. We were very pleased. The location was great and easy to find. The house was clean and decorated beautifully. The owners were quite helpful in assisting us and answering all our questions. Would certainly recommend this property, Big Dream to family and friends. Plenty of space for all the golfers plus large tables for the poker game. I rent properties from Susan and Geoff yearly. Their properties are top notch! They take care of all of their houses and keep everything fresh and modern. They are always professional, easy to work with, and quickly take care of any problems you may encounter. This is my second time bringing a group to stay in Dream Big. We were on a class trip so we had several families with preteens staying at the house. The pool and gaming systems were perfect for keeping the kids entertained when we weren't heading to an event or at the beach. The location is at the center of the Gulf Shores activities...far enough away to be peaceful, but everything is just a quick drive away. The beach is right across the street and they have plenty of chairs & beach toys to borrow during your stay. The house is clean and well- maintained. We had 12 families staying at the house. It is large enough that we had private time when we wanted it, but offers rooms big enough for us to eat together, play games, or gather to watch movies. They have the house stocked with the basics needed. It was nice to be able to cook some of our meals at the house. I would definitely recommend any of their properties if you are looking for a wonderful place to stay. There were 24 family members on our trip and Dream Big made our stay great. One kitchen for breakfast and the "early risers" and one for the "lunch crowd". We had plenty of room to spread out yet spend time together. Room for games or just relaxing on the decks. Best cousins trip ever, we may do this again!!! We brought on the New Year at the Dream Big beach house. The layout of the house was really neat and everyone really enjoyed it. Great location and the beach was directly across the street. It was beautiful and decorated very nice. we had guests fly in from Ohio and they loved the beach house. We definitely will come back again. Everything was great. We have stayed in Dream Big for three years in a row now. The house fits our needs great. Every year, a large group of us use Hangout Fest weekend as our reunion trip - This was year 6. Dream Big was far and away the best property we have stayed at so far! The house was absolutely gorgeous, and perfect for such a large group. 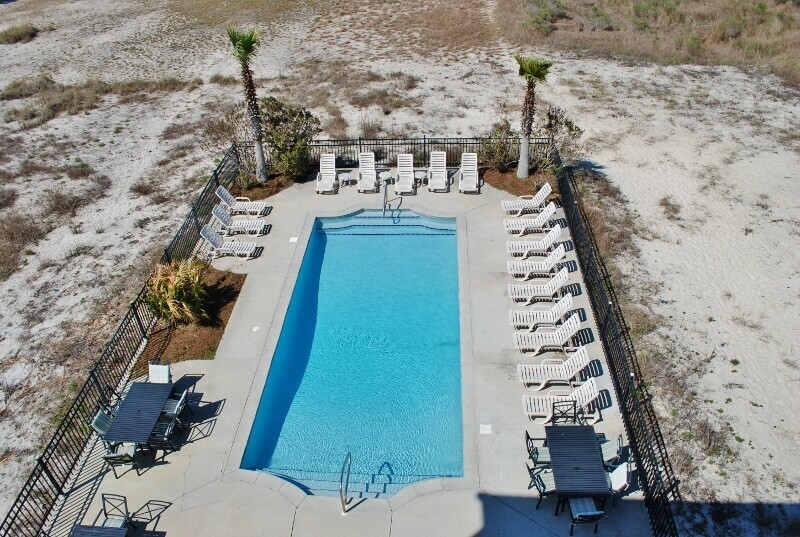 Property management, Gulf Shores Vacation Rentals, were such a pleasure to deal with and made everything a breeze. I would highly recommend Dream Big for your Gulf Shores vacation. Thanks for such a great trip! Third year of renting this property and have always had a great experience. This has not been the first time we stayed here, and will definitely not be the last! Every year we take around 30 college students with a college ministry from University of Memphis and Rhodes College to the beach. WE HAD A BLAST! Susan and Geoff were extremely helpful from the beginning of the process and throughout our stay. It was easy to book, easy to checkin and incredible experience throughout our week. The house is high quality and is a reflection of their excellence! I would recommend this for a family vacation or a large group trip, the house fits both needs!